I was really hoping to be grilling by now, but the weather this weekend was just too cold and rainy. I had venison chops on my menu, and my mind, so I needed to prep them in a different way. We have a grill pan for indoor grilling, but these small chops don't always come out the way I would like when I use it. So, a quick hard sear in a super hot pan, then finish in the oven, is the way to go ! I roasted some cauliflower in the same oven, and this was as close to a "grilled" dinner as we could get on this cold, rainy March day. Preheat oven to 400. 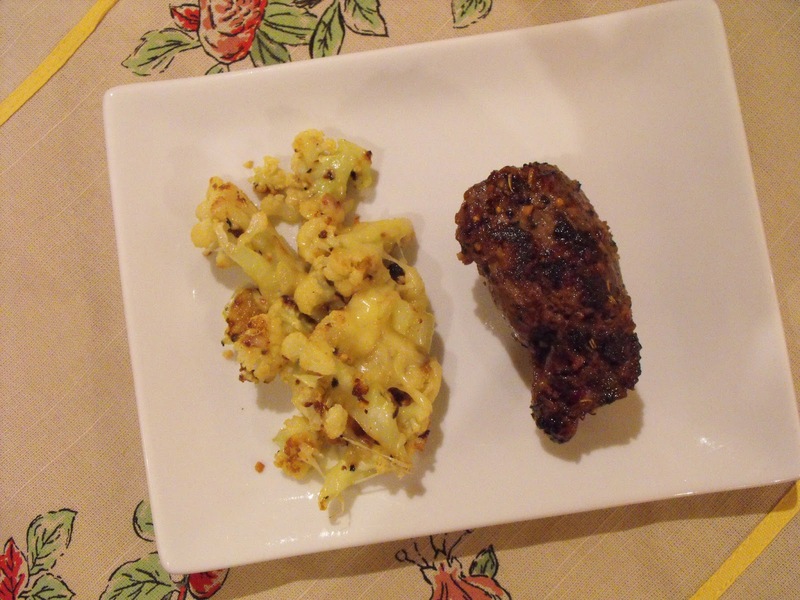 Toss the cauliflower in the olive oil and grill seasoning, and spread out on a baking sheet. Bake for 30-40 minutes until cauliflower is golden and tender. Remove to a bowl and toss with parmesan cheese. In an ovenproof saute pan, melt butter and olive oil together over fairly high heat. Add chops to the pan and sear each side 3-4 minutes until browned. Then, place pan in the preheated oven with the cauliflower for an additional 3-4 minutes, until chops ares just past rare. Remove from oven, and let rest for 4-5 minutes before serving with cauliflower on the side.